Brazil is the largest country in South America, which makes it a great choice to travel to in theory but it can be difficult to explore it well or even to get around this vast country. What surprises most travellers, are the range, depth and variety of the each different Brazil city. Because the beaches are not the only thing that are great about Brazil, and in reality there are so many others great features. As Brazil Travel Experts, we love this country and have travelled to its many different corners. Most travellers to South America only skim the surface if they even make it to Brazil. 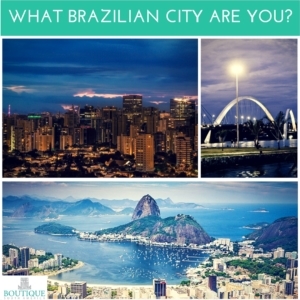 And as we want to educate and inspire you to see more of Brazil, we thought a quiz could be an exciting way to discover which Brazil City suits you best. By asking you a few questions about your interests and travel preferences, you will then receive a suggestion or two about which Brazil City you might find interesting. The possible answers to this quiz are range from the glorious Olympic city of Rio de Janeiro, the expansive metropolis of Sao Paulo, the beautiful coastal delight Florianopolis, Manaus – the iconic gateway to the Amazon and the cool capital of Brasilia. And if you want to know more about travelling to these places in Brazil, you can add your details at the end to receive some quick destination information. And if you’re interested in Brazil, you can read up on the Interesting Things To Do in 9 Fascinating Brazil Cities post on our Inspire Me Travel Blog. Or you can find our range of Brazil tour experiences here.